It's no secret that Monster Hunter 3 has been one of my favourite games in the last few years, with Tri coming out on Wii way back in 2010 and then an updated version stacked with improvements and even more monsters to hunt in the form of Monster Hunter 3 Ultimate on Wii U and 3DS last year. 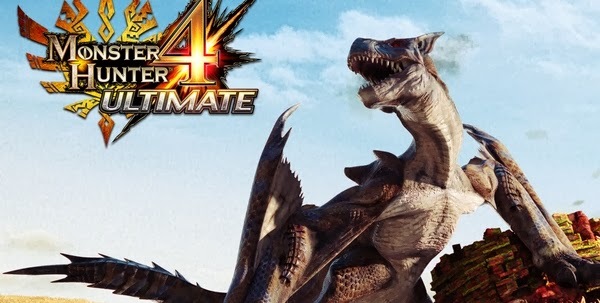 It was around a week ago during a visit to Capcom's London office, at a Monster Hunter event for fans of the game, that Monster Hunter 4 Ultimate for Nintendo 3DS was announced to the World. Capcom have been putting on these events on a regular monthly basis so players can gather together to play the game's local multiplayer mode. Headed to handhelds early next year, Monster Hunter 4 Ultimate will see a lot of new features that are already in the Japanese only version of Monster Hunter 4 that came out last September. These include the return of some classic monsters from previous generations, as well as a bunch of new ones exclusive to the new title, and also the inclusion of two all new weapon classes, the Insect Rod and the Charge Axe. The announcement video below is what we were shown just before it was released online for everyone else to see. As well as the game's announcement itself, Capcom are also holding a meet and greet with Monster Hunter Producer Ryozo Tsujimoto on a few dates at the end of this month (February 2014). These include the Capcom Europe HQ in London on the 26th, Paris, France on the 27th and then finally in Berlin, Germany on the 28th. Further details can be found in the video below.